About 39 million people in the U.S. experience migraine headaches, but fewer than 30 percent have received a proper diagnosis and treatment. Among the most common of all neurological disorders, migraine headaches affect one in five women in the U.S. and one in 16 men. The majority are not helped by current drugs. Triptans, the newest class of migraine drugs on the market, work for only a third of those who take them, and many people cannot because of cardiovascular risks. Due to side effects such as weight gain, hair loss, cognitive dysfunction and sedation, more than 85 percent of those who start treatment with preventative drugs stop taking them within a year. There is a better solution! Click on the treatments above to learn how you can decrease or eliminate chronic vascular headaches, such as migraine, cluster and hypertensive headaches without shots or side effects of systemic drug use. Traction/Inflammatory headaches are due to disease and can be caused by mass lesions such as brain tumors, hematomas and cerebral hemorrhage. If you have a sudden onset of headache without a history of chronic headaches we strongly suggest you consult your physician immediately. Tension headaches are characterized by the muscles contracting. Some tension headaches can occur due to previous trauma as well as poor posture and disturbances involving the muscles of the mastication (biting muscles). Most people experiencing occasional tension-type headaches will use simple, over-the-counter analgesics such as ibuprofen, to obtain relief. However, there are treatments that can alleviate tension headaches by treating the cause of the headache. If you experience chronic tension type headaches, AZ Migraine Relief can help you. A New, drug-free/injections free method of relieving migraine headaches. Quick, simple, and comfortable in-office procedure. In as little as a few minutes, the new SphenoCath ® device and procedure for administering a sphenopalatine ganglion (SPG) block provides you with immediate relief of headache pain with a simple, gentle, comfortable in-office procedure. The revolutionary SphenoCath ® device delivers anesthetic through the nasal cavity, effectively delivering an SPG block for migraine pain without the use of needles, cotton swabs, or harsh meds. For most, the procedure is comfortable, while others may briefly feel a very slight nasal irritation. This device allows a low risk, simple procedure that is a pain management game-changer for anyone who experiences four or more severe headaches a year. Higher success rates at administering an SPG block, with lower risk. Well-trained physicians and dentists have reported impressive success rates. The SPG block procedure using the SphenoCath ® device is both low risk and effective in patients of all ages (adults and children), as well as pregnant women—with minimal to no side effects. And because it effectively delivers an SPG block, you can expect it to work for all types of migraines and for most types of headache pain, from cluster headaches to trigeminal neuralgia to atypical facial pain and more—with long-lasting relief. Low cost, and covered by most insurance companies and Medicare. With a desire to improve the quality of life for pain sufferers, we have made this treatment the most cost-effective treatment for migraines. You’ll find most insurance companies, as well as Medicare, cover the procedure. In addition, if you’re currently taking medicine for migraines, this simple procedure may over time replace the need for migraine narcotics (which is better for you, your wallet, and your health). In fact, one SPG block treatment using the SphenoCath ® device may cost approximately no more than one month of migraine meds. Every patient is different, and while some may not find immediate relief, others may experience relief lasting days, weeks or even months. Getting serious about blocking pain. Besides the Trudenta System, currently there is very little to offer the chronic headache patient. Many patients would prefer a more instant and less costly solution. Everyone is also looking to stay away from prescription medications with their high cost and heavy side effects. Nearly two thirds of patients discontinue prescription medications due to inadequate relief and side-effects. SPG blocks achieve neuromodulation of the sphenopalatine ganglion complex. This means that the time-tested efficacy of the procedure has been shown to have both immediate and sustained results. These effects are typically sustained by interrupting the chaotic signaling associated with migraine. Although proven effective, few physicians offer the SPG block to patients because the traditional procedures are uncomfortable for the patient and demanding for the caregiver. Traditionally, the block is attempted by navigating a cotton tip applicator through the nasal passages or with a long needle through the side of the head. These approaches carry risks and sometimes require sedation. Today, establishing an SPG block has never been easier. The patented SphenoCath ® offers the practitioner the ability to offer a first-line treatment to the chronic headache patient. The SphenoCath ® delivers medication that can sustain pain relief in a 15 minute procedure that is comfortable and quick. With the SphenoCath ® an SPG block may be achieved without needles,cotton swabs, atomizer sprays, or systemic narcotics. SPG blocks have time-tested efficacy when it comes to serious chronic and episodic migrainous pain. Tell me more about the SphenoCath ® device. The SphenoCath ® device is a one-of-a-kind patented, soft, flexible, spaghetti-sized catheter which employs a flexible outer sheath with soft edges for comfort and an inner angled flexible catheter to deliver medication without the use of a needle inside the nasal passageway with maximum patient comfort. The device has a directional arrow for proper orientation within the nostril and can, optionally, include a tungsten tip and barium impregnated sheath for high visibility under fluoroscopic imaging, if needed. Depth markings on the external sheath are also available as an option. What is SPG block and why will it help me? SPG block stands for sphenopalatine ganglion block. 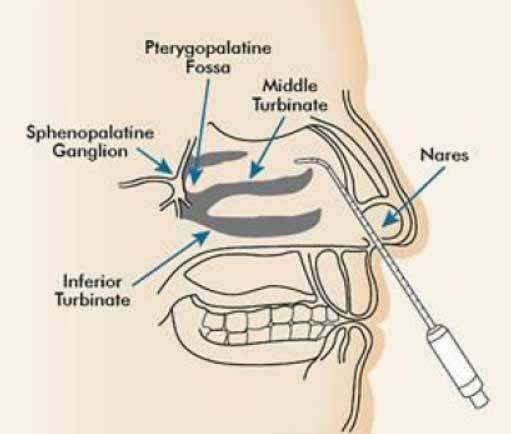 The sphenopalatine ganglion is a collection of nerve cells located just under the tissue lining the back of the nose. By applying a local anesthetic to the area, nerve impulses can be temporarily blocked, providing relief from various types of pain. The patented SphenoCath ® is designed to quickly and comfortably deliver medication to the area of the sphenopalatine ganglion. Some patients experience a minor discomfort when the small, soft SphenoCath ® is inserted into the nose, but the procedure is not painful when performed correctly. In the past, SPG block was accomplished with a long needle through the side of the head or with a stiff, cotton-tipped applicator through the nose. The patented SphenoCath ® uses no needles and is designed to be comfortable and safe for patients. SPG block using the SphenoCath ® takes 2-3 minutes. Patients are encouraged to remain in a flat or reclined position for 10-15 minutes afterwards to maximize the benefit of the procedure. The medication choice is up to your healthcare provider. Most practitioners perform SPG block using a local anesthetic such as lidocaine, the same or similar medication that is injected by a dentist or used to anesthetize a laceration before stitches. With the SphenoCath ® , however, no needles are used. The medication is absorbed through the lining of the nose. What are the side effects or risks with the SphenoCath ® ? The risks of using the SphenoCath ® include irritation to nasal cavity or mucosa, nose bleeding; and/or mild pain. Why haven’t I heard of SPG block before? SPG block has been done for many years but, until the invention of the patented SphenoCath ® , the procedure has been difficult, uncomfortable, and offered only by a few practitioners. Now SPG blocks can be done quickly, easily, and comfortably, and by a wide variety of practitioners. What about my headache medications? Do not change your headache medications unless instructed to do so by your provider. Why is the SphenoCath ® important? The SPG block has been described in the medical literature for over 100 years. It has been proven effective for many painful conditions. The main limitation to the procedure has been that it is the discomfort and risks for patients, the inconsistency of medicine placement impacting results. The SphenoCath ® addresses all of those issues, making the procedure quick, easy and consistent.